When someone places their parent in an assisted living community, they may become overwhelmed with concerns. Are there clinicians on-hand to oversee medication administration? Will my parent be happy living here? And perhaps the most important question: Will my parent be safe? Addressing and dealing with such worries is important not only for the sake of peace of mind, but also for the wellness of seniors, especially those who have Alzheimer’s disease – keeping a senior at home when they require a specialized environment and advanced care can be detrimental to his or her health and quality of life. Falls are one of the biggest concerns among the aging population. According to the Centers for Disease Control, 1 in 3 adults over the age of 65 experience a fall every year. That’s why the Life’s Neighborhood program, which is the core of Aegis Living memory carecommunities, takes special measures to avoid spills among its residents. One such preventative effort is the installation of the Philips Occuswitch lighting system. It’s a movement detector with a built-in light switch that automatically turns on the bathroom light when a senior gets out of bed at night to use the restroom. In addition to the sensors that activate the Occuswitch lights, motion sensors are utilized to provide specialized care to seniors who require a little extra attention. These sensors point toward the resident’s bed and track movement, alerting staff when a resident gets up from bed. 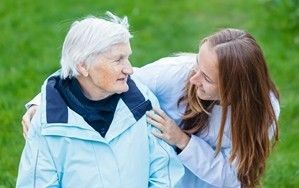 The caregiver can then come to the resident’s side to provide help with whatever he or she may need, whether it’s a glass of water or medical attention. Philips Lifeline pendants are medical alert systems that come in the form of a handy pendant with an emergency call button that alerts staff when a senior is in need of help and allows the resident to communicate with staff. This is the most advanced technology in the market. The pendant is equipped with another innovative feature: The AutoAlert system detects when a resident has taken a spill – incidents that can cause seniors to become immobilized, disoriented or knocked unconscious, thereby unable to call for help on their own. This fall-detection technology is a potential life saver for those who are unable to push the call button on their own, and it even has a locator that tells Aegis staff precisely where the senior is in the building. Proper medication administration is one of the biggest concerns among people who place their parents in assisted living communities. It’s no surprise, considering that a neglected drug regimen can be detrimental to a senior’s health. The staff at Aegis Living knows this and implements an electronic tracking system that manages medication. The system is programmed by the resident’s health care provider, scheduling delivery and tracking dosages to make sure the medication regimen is followed to the tee. It ensures better medication compliance, which means greater health outcomes, and decreases manual errors. The benefits of electronic medication systems have been proven to lead to better health outcomes. One study published in the journal Clinical and Translational Science looked into the effectiveness of such systems, surveying 105 clinicians who began using these systems to determine how it affected clinical processes. The surveys revealed that 71 percent of doctors believed that electronic medication management systems led to an improvement in patient safety. Additionally, 65 percent thought the new system of medication management was more efficient than more traditional, manual methods. Many states social and health services departments do not require assisted living staff to be trained in cardiopulmonary resuscitation. In fact, communities often have a “no CPR” policy, which mandates that staff are not allowed to attempt to resuscitate residents but rather call for emergency services and stay by the senior’s side. But at Aegis Living, the staff is trained in CPR to best support the needs of residents in the case of unconsciousness caused by choking or another medical emergency. Safety measures are a top priority at Aegis Living, and the staff are always thinking up new ways to keep the residents happy, healthy and secure. That’s why Aegis has an active safety committee that meets every month to review the communities’ safety measures. These gatherings provide open, creative environments for staff to pitch ideas, brainstorm together and work to improve the measures taken to create a safe and secure sanctuary for people with Alzheimer’s. In addition to the monthly safety committee meetings, daily meetings take place at each Aegis Living community in the form of stand-up sessions and a roster review of each senior. Staff engage in informative discussions about all of the residents, determining anyone who may be in need of specialized attention, as well as talking over the goings-on taking place around the community – disputes between seniors, upcoming events and other important topics. The aim is to ensure that staff are doing everything in their power to support the mental, emotional and physical well-being of the residents.